FoP: With a tomato and vodka molasses sauce to drizzle over. 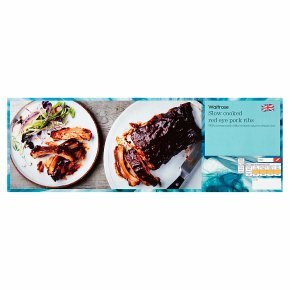 INGREDIENTS: Pork ribs (86%), sugar, hickory smoked water, water, honey, tomato paste, white wine vinegar, sea salt, cornflour, rapeseed oil, ground paprika, vodka, tomato powder, onion powder, cane molasses, garlic powder, wheat flour, cracked black pepper, ground cayenne pepper, salt, red bell peppers, smoke hickory flavouring, mustard flour, ground brown mustard seeds, paprika extract, spirit vinegar, ground black pepper, barley malt extract, flavouring, fortified wheat flour (wheat flour, calcium carbonate, iron, niacin, thiamin), turmeric. Take extra care when barbecuing. Cook first and barbecue to finish.